Intro from Jay Allison: Much of the TOOLS advice on Transom is for both broadcasters and podcasters. The technical worlds overlap. But with the resurgent interest in podcasting, Jeff Towne is embarking on a new series of features targeted to podcasters. In this first super-detailed column, Jeff covers the basics of voice recording, giving a full rundown on both USB and analog microphones, stands, pop filters, acoustical treatment, interfaces, mixers, and accessories. In future features, Jeff will talk about software, phone interfaces, servers/hosting, metrics, and more. Included here are specific gear recommendations and suggested bundles. High-quality free advice about what stuff to buy: that’s what the Internet is for, isn’t it? One of the most revolutionary and profound aspects of podcasting is its populist nature: anybody can make one. You do need a little bit of equipment, but it’s pretty affordable to get started. Once you create your production, there are no program directors or distributors barring your way, you can upload your creation to the Internet, and anyone with a computer or smartphone can hear it, anywhere in the world. At its most basic, a podcast is simply an audio file sent automatically to subscribers over the internet. More accurately, it could be audio or video, or even a text file saved as an enclosure in an RSS feed, but the most popular form of podcast is audio, and that’s what we’ll concentrate on here. The term originally referred to an audio production resembling a radio broadcast that could be saved on your iPod, hence “podcast” but has since expanded beyond that specific format or hardware. If you can record an audio file, and upload it to the internet, you can make a podcast. 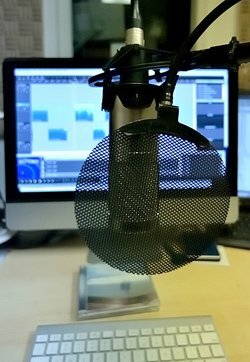 In theory, you could use the built-in microphone on your computer, or a small portable recorder, along with a basic audio editing program, to create an audio podcast. But that’s rarely the best answer: using better microphones, audio interfaces, mixers and other specialized equipment will allow you to more effectively communicate your message, without distracting audio problems. It’s difficult to attract and keep listeners if your voice is hard to understand, shrill, distorted, too loud, or too quiet. The good news is that you can get good results without spending lots of money. 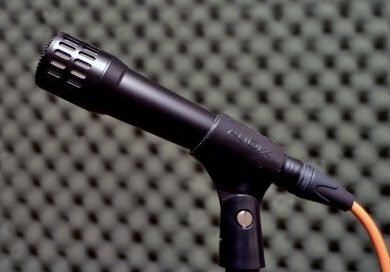 In this article, we’ll start with the basics: recording your voice. We’ll cover some rules you should follow to optimize your audio quality, and suggest some gear options that will help you sound your best. The Microphone: USB or Analog? Given that most podcasters will record directly into a computer, a USB microphone seems like an obvious choice, but we have some reservations. A USB microphone eliminates the need for an external audio interface: you simply plug the microphone’s USB cable into your computer, choose the microphone as the audio input for your computer and editing program (you may need to install drivers, depending on your computer, operating system and the microphone itself) and start recording. You can choose from a wide array of USB microphones, from simple, inexpensive models intended for videoconferencing, to headset mics targeted at gaming or VOIP, to broadcast-quality mics designed specifically for podcasting. And indeed these can be easy solutions, BUT there are some significant downsides. With a USB mic, you can only plug into your computer. If you want to connect to a stand-alone field recorder, or a mixer, or some outboard hardware processor (such as a compressor or EQ), you’re out of luck. 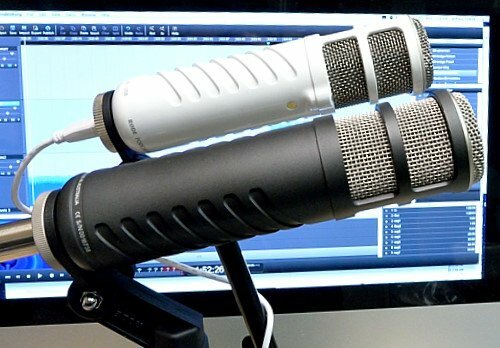 USB microphones use internal microphone preamps and analog-to-digital converters, and their quality may be lesser than what is available in a dedicated audio interface. This is especially problematic in inexpensive mics: poor preamps and A/D converters can have a noticeable negative impact on the overall audio quality. If your podcast involves multiple microphones, it’s much simpler to plug conventional analog mics into a mixer or audio interface than it is to connect multiple USB mics. It is possible to plug two or more USB microphones directly into the computer, but it complicates the set-up and can create various technical problems and monitoring issues. It’s always good practice to monitor through headphones while recording, but listening to the computer output often results in a slight delay, a latency, which can make it difficult to speak naturally, or properly assess audio quality. Some USB microphones offer direct hardware monitoring via a headphone jack right on the mic, and that can provide zero-latency, no-delay monitoring. But if there are multiple microphones, or additional sound sources that need to be monitored, monitoring from the microphone may create complications. Keeping those caveats in mind, in some cases a USB microphone may be the best answer. The simplicity of connecting a single cable, especially when using a tablet or smartphone, may outweigh any downsides. We recommend getting the best mic that you can afford; it’s the largest factor in your final sound quality. Many inexpensive USB microphones are designed for videoconferencing, telephony or gaming, where intelligibility is paramount, rather than a balanced, warm, human sound. Designed like classic dynamic radio announce mics such as the EV RE-20, this mic gives an immediate, warm, tightly-focused sound, relatively immune from room ambience. It has a zero-latency direct headphone output with level control on the mic. Rode also makes a similar mic called the “Procaster” which is a non-USB model with a conventional XLR output. You need to connect this to an external USB interface , but this allows you to have more control over the input gain, and more flexibility in how you could use the mic. You can plug the Procaster into a stand-alone recorder, a mixer, or an external mic preamp or processor. The output level of both mics is on the low-side, but the Procaster’s level can be boosted by a good quality mic preamp in the audio interface. The non-adjustable output level of the Podcaster requires a significant boost when mixing. We prefer the sound of the Procaster over the Podcaster, but they have a similar character. The Podcaster is a bit thinner and brighter, which can over-emphasize S-sounds on some voices. That said, it provides a clear, clean, classic radio sound that’s flattering to many voices, and it effectively rejects room ambience. 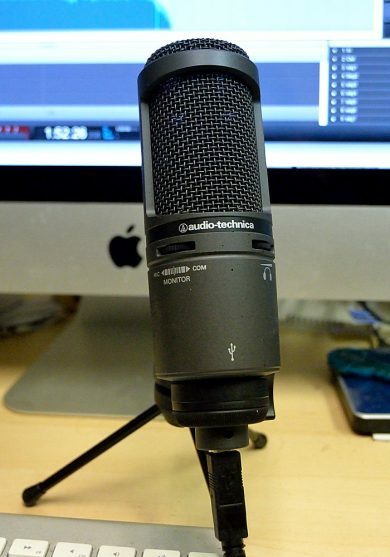 The pro version of this mic provides not only higher audio resolution, but also an analog output as well as USB; it can be plugged into a field recorder or mixer, or connected directly to a computer via USB. Both versions have direct headphone monitoring and an input gain control right on the mic. The sound quality of the analog and USB outputs are very similar, but as with the comparison of the Rode Procaster and Podcaster above, the USB version is slightly thinner and more shrill. But it’s a subtle difference, either connection method could be used successfully. 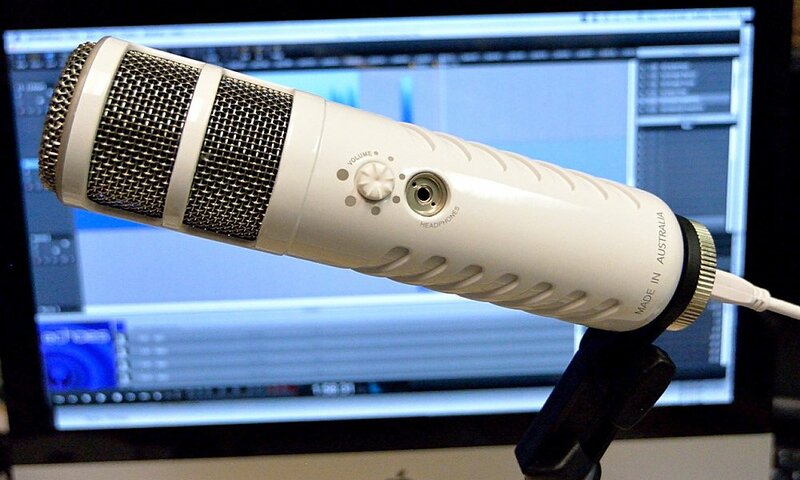 This mic has a built-in table stand which is convenient, except that it might not place the mic in an ideal position for voice recording. It may be helpful to place the mic on a thick book or small box to get it closer to your mouth. That integral table stand can be removed, and other optional mounting options are available from BLUE, so with some additional accessories, you can mount this mic in a shock mount, and on a boom arm. This mic is very sensitive to P-Pops, so a pop filter is recommended. The Yeti also has multiple pick-up patterns. The most commonly used is Cardioid, but the Figure-8 pattern could be useful for recording two speakers with one mic. If you can place the mic at a position equidistant from each person, as they face one another, you may be able to get a good recording of the two sources with one mic. This condenser mic has an even, balanced tone, but surprisingly low output for a condenser mic. There’s no gain control, and we ended up needing to boost the recorded signal of spoken voice fairly significantly (12-14 dB). Even so, it’s a surprisingly nice-sounding mic for its price. It provides direct monitoring via the microphone, along with a balance control that allows you to mix-in sound from the computer. Comes with a table stand, but as with the Yeti, that stand may be too low to be helpful for voice work. The included mic stand adapter has standard threading though, so it’s easy to attach to a boom stand or other suspension. 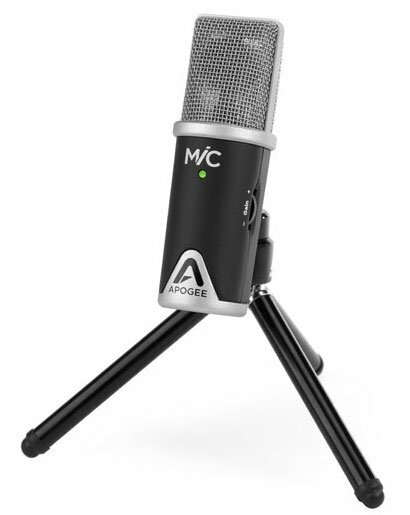 The Apogee MiC: This tiny mic is designed for direct connection to an iPad or iPhone, but can connect to a computer’s USB input as well. It has an input gain control, as well as an LED level indicator to help avoid distortion. Because it’s so small, it’s hard to position the provided tripod stand ideally, but it can also be attached to conventional mic stands. This is a side-address mic (you talk into the side, not the end of the mic) and sounds remarkably good for its size. Because of its compact form, it’s great for recording on the go. Here’s a sample Jay Allison made in a regular room with no special acoustical treatment. It sounds pretty great, especially considering that it’s a tiny mic, plugged into an iPhone, and the recording was made outside of a controlled studio environment. By the time a little EQ and compression is added, and it’s layered over a music bed, it’s hard to imagine that the voice track wasn’t recorded on a large mic in a sound booth. Discussing the ideal announce mic is a huge topic in and of itself. You may want to consult our announce mic shootout here. 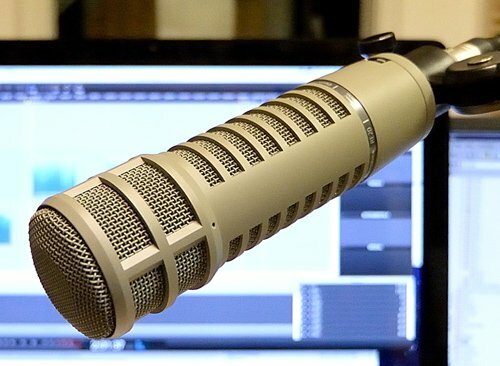 We don’t have space in this article for images and sound samples of all the popular options, but there are several microphones that have become standard in the radio world because they do a good job of recording the spoken voice. 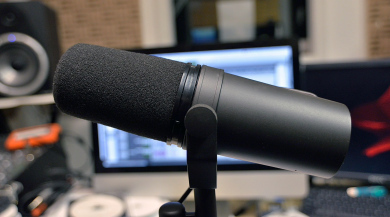 That’s something you should be looking for when assembling your podcast production gear: your voice is likely to be the main focus of attention, you want it to be clear and intelligible, but also pleasing to the ear. You don’t want people to stop listening to your podcast because you sound shrill, or distorted or dull, so pick the right microphone for your voice, and practice recording with it, so you find the distance and position that sounds best. Unfortunately, there’s no universal answer. Different voices sound better on different mics. And everyone has different taste about what sounds best, so if you can, try a few different mics with your voice (or the main voice of your podcast) before making a permanent decision. A few things to keep in mind: dynamic microphones can be excellent announce mics, and many of the classic designs have tight, focused patterns that reduce the effect of less-than-ideal room ambience. However dynamic mics have a low output, and need lots of good-quality gain from a preamp or interface. They can be susceptible to radio interference or electrical fields, which can create buzzes or other noises on the signal. You may want to invest in a Cloudlifter, a device that uses phantom power from your mixer, or interface, or recorder, to add gain to dynamic mics. Condenser mics generally have a hotter output, and therefore don’t need quite as much gain from an interface or preamp, so you may get better sound quality from basic mic preamps and audio interfaces. But condenser mics tend to be very sensitive, and may pick up more background sound and room ambience than their dynamic counterparts. In the last several years, prices have dropped on entry-level large-diaphragm condenser mics. and it’s possible to get some good values on this style of mic. Electrovoice EV RE-20. The classic radio announce mic, it provides a reliably warm, big immediate sound that flatters most voices. It has a very tight pick-up pattern, reducing the intrusion of room ambience on the recording. It has decent built-in pop-filtering (although it can still benefit from a pop-filter) and adjustment switches for tweaking bass response. It requires a good mic preamp, either stand-alone, or in your mixer or USB interface. It’s expensive, about $450 new, but keep an eye out for used mics, they’re very robust and are often for sale second-hand. There are some similar models that are more affordable: the RE-320, or the RE-27, and those can be viable options, but the RE-20 remains the classic. This is also a classic radio announce mic, with many of the same pros and cons as the RE20. It has a built-in foam pop-filter that’s fairly effective, as well as built-in shock-mounting. It has switches that can roll-off bass and boost midrange. It usually sells for about $350 new. Rode Procaster. This is a new mic, modeled after the classic mics above. Its sound is pretty similar, and it has the same general attributes (tight cardiod pick-up pattern, but relatively low output levels) and it’s more affordable (about $230.) There are no roll-of switches to customize the low-end performance, but that can always be adjusted when mixing. There’s a sound sample above, with the Rode Podcaster sample. One shouldn’t overlook the classic hand-held small-diaphragm dynamic mics, such as the Shure SM58, the Shure SM57, or the Audix I5. These are very affordable and versatile microphones, and serve voices well. Audio Technica AT 2020: A very affordable mic from a reliable manufacturer. See sound samples of the AT 2020USB+above. Studio Projects B1: A very affordable mic with a surprisingly rich sound. Comes with a foam pop filter and a shock mount. 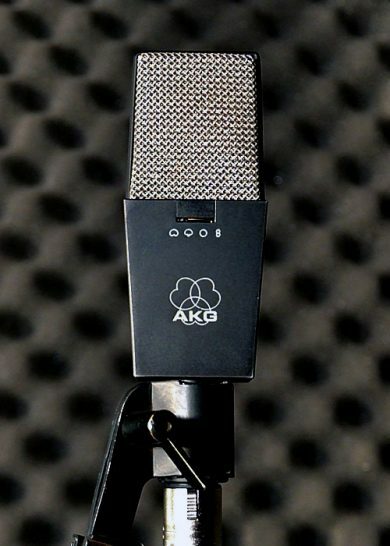 AKG Project Studio P220: A budget entry from a respected mic company. The Project Studio P220 seems to be the successor to the Perception 220. Rode NT1: Good announce mic from a company that generally provides very good value for the dollar. Neumann TLM 102: Smaller, less expensive version of the classic announce mic from a renowned company. Surprisingly rich sound for a small mic at a (relatively) affordable price. 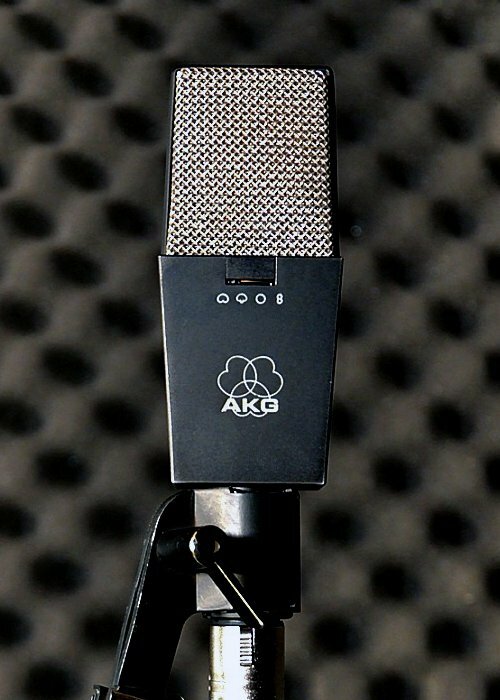 AKG 414: A studio classic: very flat and accurate. Several switchable pickup patterns and bass rolloffs. Neumann TLM 103: (Relatively) affordable single-pattern version of a vocal classic like the U87. 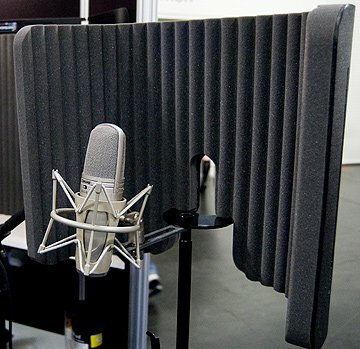 Neumann U87: When budget is not a factor: industry-standard, top-of-the-line voice mic. Very warm and rich sound, very expensive price. Many of these mics were included in the Transom mic shootout. There are photos and sound samples there. Choosing a mic is just the start: there are a few more components you’ll need. 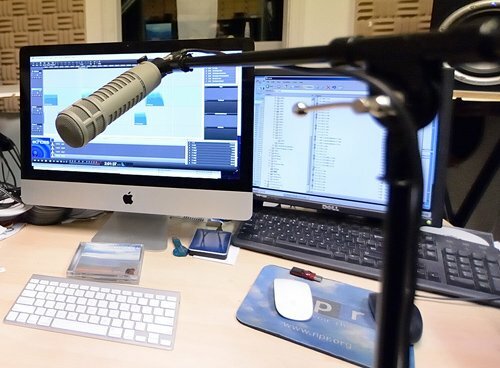 Many mics, especially those specifically designed for podcasting, come with a short stand, intended to be placed on the table or desk. But table stands are problematic: they rarely position the mic close enough to the speaker’s mouth, and they’re very likely to pick up thumps and rumbles from the table surface. An isolation mount (sometimes called a shock mount) can help, but won’t completely eliminate vibrational noise. Computers, hard drives and other machinery may seem very quiet, but be subtly vibrating your desk or tabletop without you realizing it — until you put a sensitive mic on it, and discover rumble. If you do get a table stand, try to get one with a telescoping shaft, to allow greater height and adjustability. Consider placing the table stand on something soft (but stable) such as a foam mousepad, or some other material that will isolate the mic from vibration. You’re much better off using a tall stand with a boom. That way the stand can be placed apart from the table, and more accurately positioned close to the mouth. These stands can benefit from an isolation mount as well, and care should be taken that no one kicks or otherwise bumps into them. Spring-mounted boom arms are useful if it’s possible to mount them securely; ideally on something other than the table or desk where the announcer might thump or pound. As above, isolation mounts can reduce vibration problems. Because announce mics tend to sound best when positioned close to the speaker’s mouth, there’s a risk of P-Pops and other breath noises. With careful positioning and speaking technique the problem can be reduced, but it’s safer to add a pop filter. The nylon or metal mesh discs are more effective and audio-transparent than foam pop-filters. These on-mic pop-filters are small, unobtrusive, and work fairly well, but are not quite as effective as the larger mesh or metal discs on a gooseneck. Also, they only work on side-address microphones, not end-address mics, like the RE-20, or SM7. The metal mesh pop filters are more durable, and seem to be more effective than the nylon versions. If using a nylon mesh filter, the dual-layer design is much more effective than single-layer. As we always stress when recording in the field: wear good headphones, monitor what’s coming in through your microphone. That’s equally important when recording a voiceover. You need to hear that you’re close enough, but not too close, make sure that you’re not popping your Ps, blowing into the mic in other ways (e.g. exhaling through your nose! ), bumping the mic stand, or simply in need of a drink of water. So get a good pair of headphones, and wear them while recording. Because these voiceover mics are very sensitive, you need headphones that isolate well. If they’re too “leaky” you can get feedback, or other unpleasant effects of audio spilling from your headphones into the mic. We are big fans of the Sony MDR-7506 headphones for field recording, and they work equally well in the studio. They isolate well, and have plenty of bass response to help you hear if there’s vibration noise or plosive distortion. One big challenge to getting a good podcasting sound is the ability to mitigate the effect of room ambience and background noise. First: find a quiet place to record. You can do some things to reduce the boom and echo of a standard room, but nothing short of a professional sound booth will block the sound of loud traffic, a barking dog, a crying baby, or loud industrial noise. If your space is simply a little too “live,” causing your voice to sound distant and echoey, there are some treatments available. Please see Voice Recording in the Home Studio. Instead of building a portable cube, as described in that article, consider the many reflection filters now available that serve a similar purpose. Keep in mind that they’re no substitute for a sound booth, but they can help reduce the ambient sounds of an untreated room. Remember that it’s also very helpful to have something soft and absorptive behind you, not just behind the mic. Try to suspend a blanket or quilt on a clothesline, or drape it over a shelf or room-dividing screen. Or place yourself in front of an open closet full of clothes. And as noted above, a large diaphragm dynamic mic will be less sensitive to room noise than a large diaphragm condenser mic, but will require more amplification, and therefore is more susceptible to hums and buzzes from electrical or radio interference. When using a traditional analog XLR microphone to record a podcast, you’ll need a USB (or Firewire, or Thunderbolt) audio interface. These can range from tiny devices that plug directly into the microphone, to multi-channel boxes that can connect many microphones simultaneously. A USB interface provides great versatility, usually allowing connection to almost all computers. These interfaces will provide direct, zero-latency monitoring of the inputs, and better audio quality than a USB microphone. Most provide some kind of audio level metering to help set proper levels. The smallest of the interfaces act like extensions of the microphones: they plug directly onto the XLR jack at the end of the mic, making them very unobtrusive and easy to carry. Most can provide phantom power to condenser mics via the USB connection. They require no batteries or other power. The Senal XU-1648 is a small dongle that connects directly to the microphone, with a USB output. It has a headphone out, along with control dials for input gain and headphone level, and can provide phantom power to condenser mics. The CEntrance MicPort Pro is similar to the Senal, with a comprehensive set of dials for setting levels and balance between direct mic signal and playback sound from the computer. Can provide phantom power. The Shure X2U is another of this type with similar controls, including phantom power for condenser mics. A slightly larger box-style USB interface can be more convenient in many ways, providing larger control dials and better metering, and often a more powerful headphone amp. 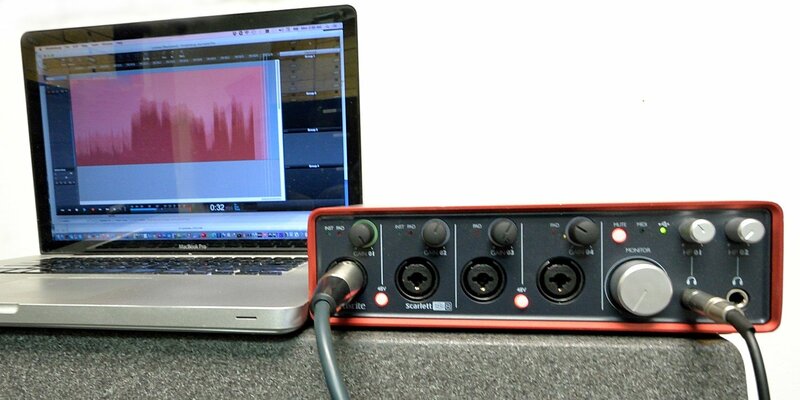 The Focusrite iTrack Solo can connect one XLR microphone to a computer, or directly to an iPad or iPhone. Two microphone inputs can be very handy when you’re interviewing a guest and want two mics live at all times. These interfaces will feed each mic to its own channel in your recording software, allowing you to later mix the levels independently. Most of these interfaces also are powered completely by the USB connection, removing the need for an external power source. But be sure to connect them directly to a USB jack, not a hub. Some computers do not provide full power to all USB jacks; if your interface is not functioning properly, try another USB jack. Here are a few good-sounding and easy to use interfaces with inputs for two XLR mics. For more complex recording scenarios, you can record four channels (or more) with some larger interfaces. These usually do require their own power cables, USB power alone is rarely sufficient for larger numbers of mic inputs. There are rack-mount interfaces that utilize USB-2, USB-3, Firewire or Thunderbolt connections, and provide many channels of input and ouput, but the average podcast rarely requires that many connections. The interfaces listed above will feed each input to its own discrete channel in a multitrack recording program. In some circumstances, you may want the flexibility of a mixer. You could connect any mixer’s stereo outputs to a USB interface, but there are mixers that combine both functions in one device. Pay attention: many USB mixers will only send the mixed stereo output to the computer, while a few may be capable of sending individual channels as well. Both styles can be useful, just be sure you know which kind you have. A mixer can be a good solution for two or more mics, and for adding in music, or a phone call, or other inputs in real time. If you plan to hook up a phone hybrid to connect with someone on the phone, be sure the mixer has at least one pre-fader aux send, so that you can set-up a “mix-minus” routing for the phone hybrid. A mixer that can only send the stereo output to the computer can still be used to send two microphones to discrete channels for mixing later; simply set the pan control of one of the input channels all the way to the left, and another input all the way to the right. The major downside is that monitoring through headphones is weird, with one mic in one ear, and one mic in the other ear. But that style mixer can be very efficient if you feel confident in mixing the session live rather than returning to it later. Alexis Multimix: Tiny, with two XLR mic inputs, and a stereo line input. Yamaha AG06: Two XLR mic inputs and a stereo line in. Can work with Windows, Mac or iPad. Alesis Multimix 8 – 4 XLR mic inputs, 2 stereo line inputs, built-in effects. Allen and Heath ZED 10: 4 XLR mic inputs, 4 mono line inputs, 2 stereo line inputs. Mackie ProFX 8. 4 mic preamps, 2 stereo line inouts, built-in effects. The Mackie 820i(firewire) has three XLR mic inputs, plus two (or three) stereo line inputs. A mixer like this can give you the flexibility of recording each individual input into a multitrack recording program for mixing later, or you can simply record the stereo output. 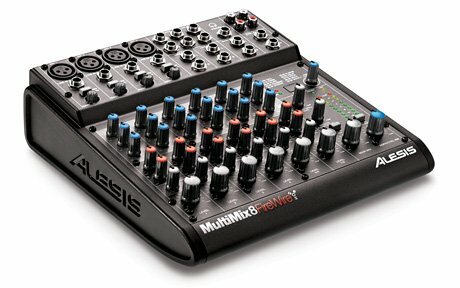 There are larger versions of this mixer with more channels, as well as versions made by Presonus, Allen and Heath and others. If all these options are seeming a little too daunting, here are a few packages that have all the elements you’ll need to get started. Enough about the gear . . .
Of course, as with all creative projects, the gear is not the most important element, the content is. But poor audio quality can distract from strong content. It’s a real turn-off for a listener to hear explosive P-Pops, or crunchy distortion, or to strain to hear what’s being said. The right equipment can help avoid those problems. If you find a good mic for your voice and your recording environment, and an interface that allows you to record cleanly and hear what you’re doing, you can create an appealing audio production. There are affordable choices, but it’s also worth spending a little money on quality tools, if it helps you deliver your message more effectively. Hi Jeff, nice to see you helping out new podcasters. While the choices of mics are nearly infinite, what a lot of podcasters are now using is the Audio Technica ATR 2100 and AT 2005. 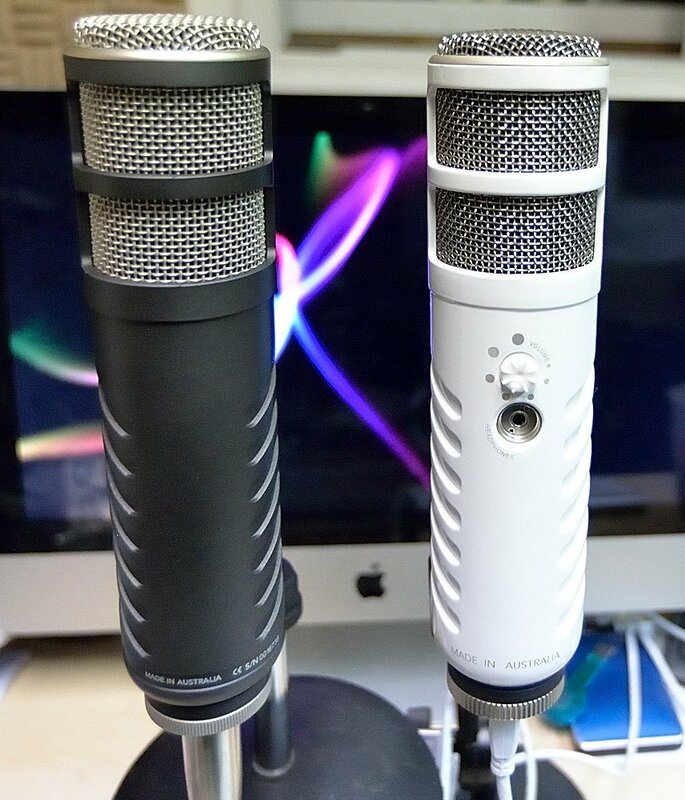 These are dynamic mics, which seem to be a good choice for home studios, otherwise known as livingrooms and bedrooms. They are USB/XLR, so they can grow with you as you add to your equipment. They actually sound quite nice and I use these as my guest mics. I save the SM7B for myself. The price is about $60 on Amazon, but often on sale for less. Also, you recommended the Cloudlifter for people who would like to boost their mic signal. The Triton Fethead is equal in performance and boost (plus a very clean boost), yet is priced $50 less than the Cloudlifter, is smaller and mounts in line with the mic. Hi Mark, thanks for that info – as you mentioned, there are just SO many potential microphones out there that it’s just impossible to test them all! The ATR-2100 and AT-2005 are small-diaphragm, hand-held designs, more like a Shure SM58, or other mics you might see a singer use on a stage. There’s nothing wrong with that design, you can indeed get a pretty pleasing vocal sound with mics like that, but just as a general rule, I tend to prefer the sound of a larger-diaphragm mic, at least if the environment can be controlled a bit. It’s absolutely true that those smaller mics are a little better at isolating the voice from background noise. But there’s also a different character to them, including a tendency for the built-in pop-filtering to make S and F sounds a little slushy or gritty. And they also need a good amount of boost, so an XLR version will need a pretty nice mic preamp in the USB interface or recorder, and the USB output might need some cranking-up in your digital editor, which sometimes can increase noise and other unwanted audio artifacts. 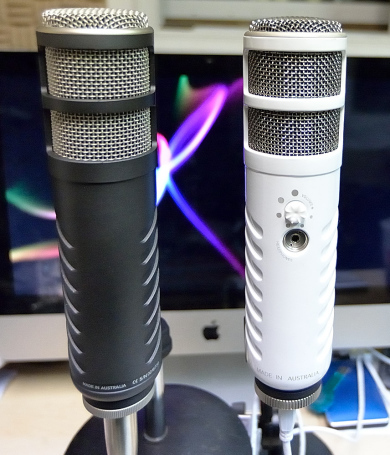 Ultimately, those mics might be worth a try, as you mentioned the prices are very good. But then, the AT2020, either the XLR or the USB version, sells for only about $100, and I do think you make a bit of an audio- quality jump up when you use a larger condenser mic like that. But in the end, whatever works for you… I’m glad to have a good recommendation from you from real-world use, and indeed, I’d probably want to think of them as secondary mics, rather than the main host mic, which we were thinking of in this first installment of the series. And thanks for the tip on the Triton FEThead, I wasn’t familiar with that one. I had tried some other similar device a few years ago and thought it added lot of noise along with the boost, but I quite liked sound of the Cloudlifter. (These are small devices that plug in-between the microphone and the mixer, or recorder, or USB interface, or mic preamp, and add gain to a dynamic mic, using phantom power. They do not work with condenser microphones, but then, those mics usually have plenty of gain already! This only works with a balanced, analog, XLR connection.) I’ll have to try one out: I particularly like the idea of the device just being in-line with the mic, not a separate box, as all the various Cloudlifter models are. Thanks again for sharing your experiences, please keep the tips coming! Any other readers are encouraged to share stories about what gear has worked, or just as important, NOT worked for you. And please stay tuned for future installments of this series! ATR2100 usb is a piece of junk. I just returned it to micro center. The sound volume was 1/3 of a USB condenser mic. The usb port was crap, and by moving usb cable just a little, u had super loud humming noise – usb would never stay connected “right” so noise would constantly go in and out. Thanks for this comprehensive article. I’d love an article on ways to record a conversation between people in different locations. How can you improve audio for a skype-type conversation? Thanks. Thank you so much for the info! What’s the best way to record an interview with one of the people speaking over the phone or Skype? surprised you didnt mention something like the ZOOM HN4/H5/H6? Kind of an all in one package that can easily be scaled up to a user’s needs if they add more inputs. Plus it’s portable. Thank you for all your advice and thorough advice Jeff! I heard about your work from Michael Garofalo of StoryCorps who spoke very highly of your knowledge. I have a podcast show and am hoping to improve my audio quality and production. I would like to set up a 2 mic set up for both myself and the interviewee. I am curious as to what mics you would recommend for 2 people doing an in-person interview and if headphones are needed. Also, feel free to email me at jmhanlon8@gmail.com if that is easier to reply there. Many thanks! I’m looking for a small digital audio recorder that minimizes surround noise. I want to be able to record my voice outside, use it for voice to text and with a good enough quality to upload for podcast and audio youtube use. Don’t mind adding an external mike if necessary. Easy to use and reasonably priced. Suggestion? Thanks for the helpful guide. Are there any interfaces with 6 XLR inputs you could recommend? Thanks! Hey Jeff- question for you! Can you recommend any equipment or advice for those wanting to podcast on the fly. My podcast is much more geared towards live moments in every day life- very rarely would I ever be sitting in front of a microphone at my desk. I’d like to get a personal digital recorder but I’m wondering if anyone’s had experience with this? phone conversations that will then become part of a podcast? Hi Jeff – excellent article. What do you recommend for live webcasting? Would you recommend VOIP or landline? Which mics are best suited for this scenario? I don’t know what to do. I tried moving from room to room. Changed USB cables and tried to record on my older MBP 13. I even recorded in my car. Humming is still there – the only way can get rid of it is with software. Is this normal? I’m trying to record a course for Udemy and this mic noise problem is killing me. I’ve spent a week trying to deal with it. What can I do – please help. Terrific article. I’ve been wanting to upgrade from my AT2020USB (first version). The Procaster and NT1 both sound great with my voice, but I’m wondering about audio interface vs full mixer. I’ve looked at the 2i2, but have been steered towards the Audient ID14 for its better preamps or even something like the Allen & Heath Zed10. Thoughts? I love the SM7B. Listen to this and decide. Except for a deeper low end due to the reinforced diaphragm on the SM7B, the SM57 with a windscreen is a surprising alternative that seems to hold its own if you position it well. Depends what sound you’re going for. Thank you, thank you from a complete neophyte. Thank you so much for posting this and helping those of us that are new to podcasting. I didn’t need to search anywhere else. You’re the best. This is really helpful – except I don’t understand the terminology or technology at all (do you have to be a techy to produce a podcast??). A friend has got a zoom h2n and I was thinking of just recording interviews directly on to that, then downloading them on to Audacity to (try) to edit there. Does this sound like a reasonable plan? Am I missing something major out of this. Anyones advice would be gratefully received! What would be the best recorders to use with an elector voice RE 50? I will use it for doing interviews. Hi – This article was very informative. I am developing a podcast with a friend. There will be two host and I’m assuming it’d be best if each host had their own microphone. But there will also be guest, two or sometimes three guest at a time. Is there a microphone that you cold recommend that can pick up a conversation between 2-3 people. Awesome info here, the links at the bottom need updating. I’ve been working through your tutorials and just want to say how useful they are for me. I know it is a tremendous amount of work to create them. I’m working out the basics of audio recording as we speak and all of it has been informed by you content. Thank you.